We’re accessible and responsive, and we look forward to hearing from you. Click on this Google map to see where we’re located and for precise directions from your point of origin. Take 490 East to the South Avenue Exit, #15; bear right. Turn left on Byron Street, turn left on S. Clinton Avenue, then turn left on Woodbury Boulevard, our building will be on your left, after Geva Theatre. Take 490 West to the Clinton Avenue Downtown Rochester Exit, #16 (keep left). 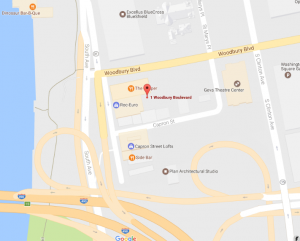 Take the first left on Woodbury Boulevard, our building will be on your left, after Geva Theatre. Take 390 North to 590 North to 490 East. Exit at the Clinton Avenue (NY 15) Downtown Rochester Exit, #15 (keep left). Take the first left on Woodbury Boulevard, our building will be on the left, after Geva Theatre.